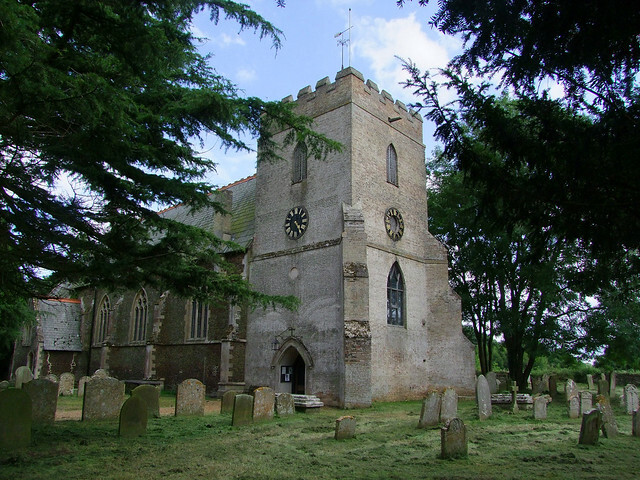 Hilgay is one of those large, independent south-west Norfolk fen villages that feel as if they really ought to be in Cambridgeshire. The church is set away from the village centre, and you'd be unlikely to find it without a map if it wasn't for the handily named Church Street. 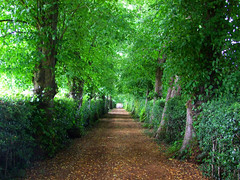 All Saints is set about a hundred metres back from the road, and the avenue of limes that lead up to it are undoubtedly the longest in East Anglia. A local once told me it was the longest lime avenue in the world, which may also be true, although I don't suppose there are hundreds of lime avenues in Africa, Latin America and South-East Asia queuing up to compete with it. 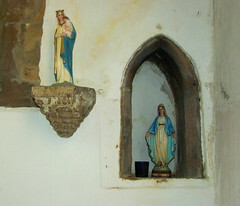 The church appears long and apparently low, although this is in fact an illusion caused by the squatness of the tower. 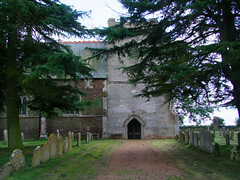 It appears very un-East Anglian, the nave and chancel in layered carstone and the tower in white brick. The carstone of the south aisle is not layered but ragged, and this creates a very primitive, rugged effect, like a marbled gingerbread cake. The ramshackle appearance of the tower contributes a bit as well. 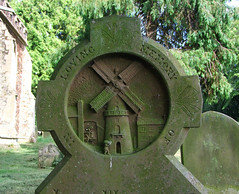 The large gravestone with an anchor, cross and heart on this side of the graveyard is striking, and you might think at first it is the memorial to Hilgay's most famous son, Captain Thomas Manby. 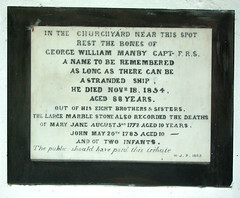 Manby was the inventor of the Manby cradle, a device for rescuing sailors from stranded ships at sea (I hope you're taking notes, there will be a test at the end) but in fact it isn't. 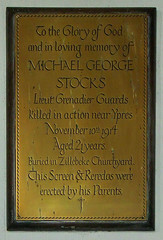 His memorial is inside the church. 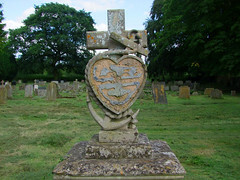 When I came here in 2005, this large memorial, which actually depicts the Christian virtues of Faith, Hope and Charity, still had a heart-shaped lead-plate with the name and details of the grave's inhabitant, but it won't surprise you to learn that this has long since been stripped away. 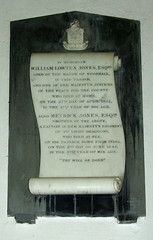 The best memorial on this side of the church is to John Whittowe, who died in 1891. 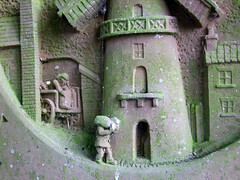 It features a deeply cut relief of a windmill, the workers busy unloading sacks of grain from the back of a cart. 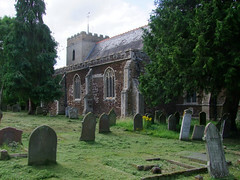 George Street undertook the considerable restoration of All Saints in the 1860s, although the tower predates this by about seventy years, replacing one which collapsed in the 1790s. 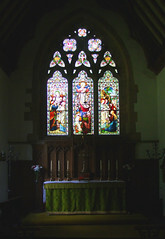 The interior is wide and open, and at first appears almost entirely 19th century. 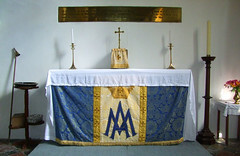 The aisle is as wide as the nave, and the aisle chapel altar is as grand and dressed as the main altar. It feels a little like two churches side by side. Just inside the door is a very rare beast, a glass-walled funeral bier. The font is a grand Victorian marble job, and matches the not quite so successful pulpit. They do seem a little out of place here, a reminder that Street's urban, sophisiticated style is sometimes a little uncomfortable in East Anglia. 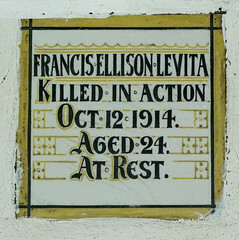 A fashion which never really caught on, more's the pity, was the practice of placing encaustic memorial tiles on the wall. This seems to have arisen in the 1880s, and had more or less disppeared by the 1920s. 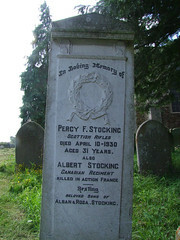 There are some at Hilgay, which are particularly interesting because they include three to boys killed in the trenches of the First World War. 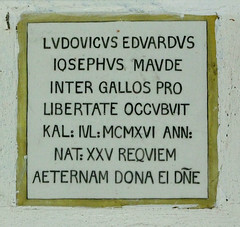 One of them is in Latin: Ludovicus Eduardus Iosephus Maude, it reads, inter gallos pro occubuit kal: Iul:MCMXCI ann: nat: XXV Requiem aeternam dona ei Domine. This translates as 'Louis Edward Joseph Maude, who died in the war for freedom, first day of July 1916 aged 25. 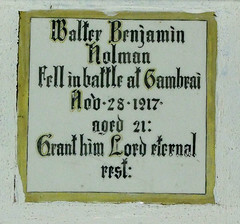 Grant him eternal rest Lord.' Which is to say, of course, that young Louis Maude died on the first day of the Battle of the Somme. There is a good set of 15th century benches with animals on some of the ends, including a rather disturbing anthropomorphic creature that I suppose must be something from a bestiary. 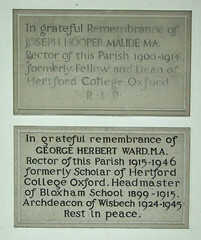 From a century or so later comes the memorial to Henry and Ursula Hawe in the south aisle chapel. 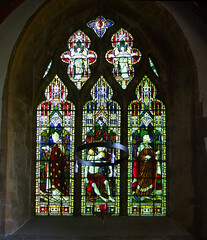 All Saints is at first sight not the most exciting of churches, but it is full of little details and has a lovely harmonious feel, from the stations of the cross to the good late 19th century glass by Ward and Hughes, from the screen brought from the redundant St Mary Beswick in Manchester to the jaunty little gallery shoehorned under the tower which Pevsner, unaccountably, thought dull. 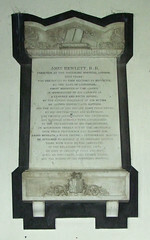 Captain Danby's memorial is in the south aisle chapel, and records that his is a name to be remembered as long as there is a stranded ship. Poignantly, the memorial also remembers four of his eight brothers and sisters who died in infancy. It is a fairly typical sentimental memorial of the mid-19th century, but has a striking addition that you only notice after a moment. 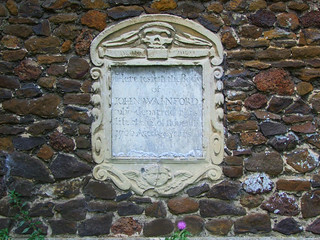 In another hand along the bottom, someone has inscribed carefully The public should have paid this tribute. How curious! There must be a story there somewhere. 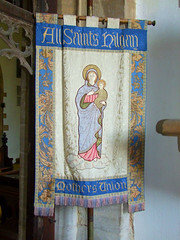 This church has a long-standing Anglo-catholic tradition, and as part of that it used to be open every day. I am afraid that this is no longer the case, and there is not even a keyholder notice now.